Experienced sprout growers -- I have questions! Re: Experienced sprout growers -- I have questions! Yesterday I found my notes for making sprouts on a paper inside an old cook book I have not use in years. 40 yrs ago house we lived in kitchen window was sunny. Mason jar with air tight lid sprouts 2 times faster than mason jar with screen wire over the top. It looks like 99% of the seeds sprout in the jars with an air tight lid while the jar with screen wire top often has about 20% seeds that are not sprouted. Jar with air tight lid seems to work like a mini green house setting in sunny kitchen window. Air tight lid seems to work better but it is more trouble because lid has to be replaced with screen wire several times every day to rinse seeds. 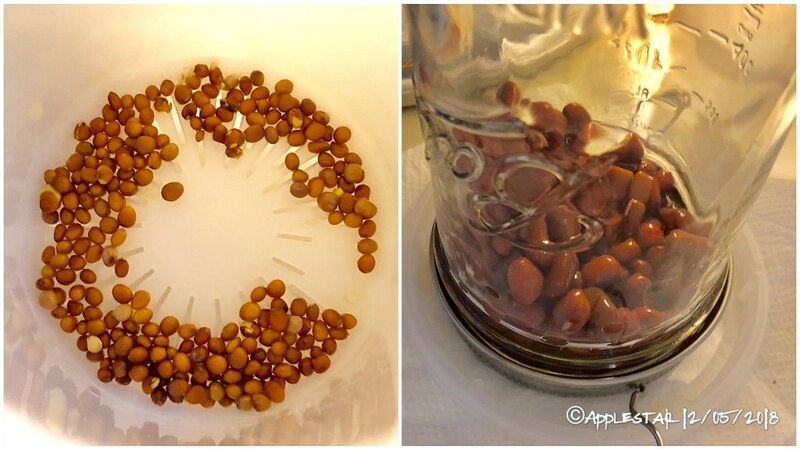 Filling jars completely full warm water a few minutes seems to work better than quick rinse. During the week when we go to work seeds do not get rinses from 9 hrs very often seeds sour. Sat & Sun we have better luck with sprouts, we try to remember to rinse seeds every hour all day. We been feeling jars full of water at bed time then dump & rinse sprouts every next morning hoping this will help prevent sour sprouts that don't get rinsed for 8 hrs. Sprouts are growing little green leaves in the sunny window these are great substitute for lettuce. During summer I did sprouts in the garden. Sprinkle 100 to 200 seeds on the soil cover them with 1" of soil. In about 1 week seeds sprouted then another 3 days they are large enough to eat. Water melon seeds get fuzzy hairs on the sprouts if they grow to long but cantaloupes don't. Beans do good. Pull plants up roots wash off fairly easy sometimes depends on what seeds I have planted. I started cutting plants off with scissors I don't want to spent time cleaning roots. I was going to grow sprouts inside the house this winter in 12" flower pots but so far I have not done it. It’s a toss-up Gary350 — I agree the closed jar in sunny window would probably increase germination and growth during the cold months, but I think it would also increase chance of spoilage, so you will need to monitor closely. My adzuki beans have been too slow (15°F coldest outside overnight — I’m guessing economy mode overnight thermostat temp is a little low for beans) — they grew seed roots of about 1/2 inch but I decided to not wait any longer and cooked the lot in last nights white short-grain rice + pressed barley. There was a difference in the aroma of the cooked compared to when the beans are added dry, and I overestimated the amount of water and the rice turned out softer and stickier than expected. Also, I used white rice because I’m out of brown rice, which meant the fuzzy-logic rice cooker finished cooking in significantly shorter time than if this had been brown rice. The fully soaked and sprouted beans were mildly crunchy - like steamed vegetable-crunchy - and very good. I missed the sort of nutty flavor that normally results from dry cooked adzuki in rice, so I added walnuts as well as salt to my serving, and it tasted very good. I also ate another serving of the hot rice mixed with some tuna salad and that was good, too. I will make this again. quick question for you experienced gardeners out there! Are there any Earthbox growers here?